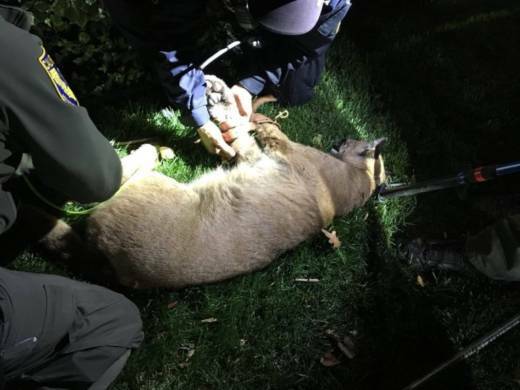 A mountain lion roaming the parking lot of a busy office complex in Pleasanton has been tranquilized and removed with some high-tech help. Police in Pleasanton, California, and California Department of Fish and Wildlife officers used a drone with thermal imaging cameras to track the puma, which appears to be about a year old and healthy at about 80 pounds. The Puma was first seen roaming the complex on Hopyard Drive on Monday afternoon. Landscapers working nearby first spotted the animal and called police, according to a local paper. Once located, officers used four tranquilizer darts to sedate the puma, which was then removed from area bushes around 8:20 p.m. Fish and Wildlife Lt. Clayton Garrett said they were in a hurry to get the job done so that the animal could be released in a more suitable wilderness area. He said what they didn’t want is for him to wake up while they’re driving him out to a safer spot. Amel Ahmed contributed to this report.